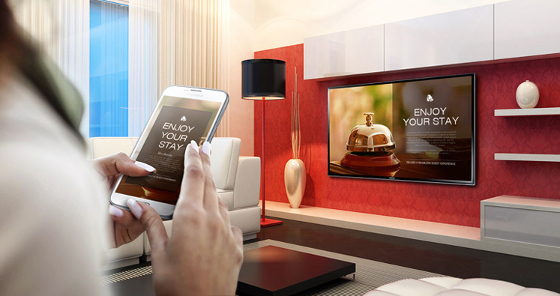 IPTV systems are most commonly used in hotels, hospitals, airports, waiting lounges, restaurants, clubs, waiting areas etc. With our IPTV Systems customers can transmit, HD Quality free to Air and Pay TV channels over Data Network without any interruption. Along with standard TV channels, value-added services such as Video-On-Demand (VOD), Music-On-Demand (MOD), Digital Signage and advertising services, Interactive TV (ITV), interfaces to property management systems (PMS), Fire & Safety/Evacuation systems etc. Various custom applications as well as non-standard applications such as baby camera systems in hospitals, live event streaming/monitoring etc. are also possible. IPTV is today’s latest TV delivery method. For customers who do not have the network infrastructure to run IPTV technology we offer solutions that can get you the same features using your legacy coaxial cable, UTP or telephony infrastructure. We also offer SMATV systems for the customer who want to keep it simple and cost-effective. A large benefit from IPTV is the ability to offer a huge range of powerful services, not available within analogue environments. Examples are: Electronic Program Guide (EPG), Audio language selections, and Subtitle selection. All resulting in a better service to the guests. IPTV head-ends are designed for “modularity, high-density and flexibility”. The head-ends are designed to deliver analogue and digital broadcast services to their subscribers. Multiple inputs such as IP, DVB-S/S2, ASI and DVB-C Can be inserted into the system. This shows its ability to adapt to different stimuli. Digital content over a wide network of IP addresses.